Those of you in the UK with children on half term break will have been seeking ways to have kept them entertained. If any of those same children are in year 3 you will know they have been studying Egypt so the perfect time to take them to the British Museum to see all things Egypt! Working in the travel business I felt well qualified to take my 8 year old god-daughter out for the day to see the Egyptian rooms at the museum. However she immediately put me to shame on the train, by sharing with me and anyone who cared to listen, the whole story of Howard Carters discovery of Tutankhamen’s tomb and that the treasure was actually in the Cairo museum and not London! Once we had established the fact that there were other artefacts to be seen we settled into a happy companionship about what our goals for the day were. Looking at things through a child’s eyes we learn things from a completely different perspective and once at the museum we proceeded to admire the different items on display. 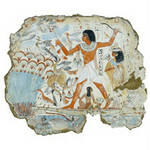 The tomb painting of the nobleman Nebamun hunting in the marshes (picture above) from about 1500bc is painted in beautiful detail and my god-daughter cast a critical eye over the work and declared that the painting was good but would be better if they filled in the missing bits. We explored the mummy room in detail and I was asked several times if there really were dead people wrapped up in those clothes. My replies of yes were backed up by the helpful x-ray pictures now on display on the cases as well which also show the artefacts and amulets still wrapped in the layers around the bodies. We had to closely examine the hieroglyphs on the mummy cases so we could pick out the symbols that spelled her name and it was declared that the canopic jars we saw were far too big as the ones in her text book were much smaller! On the ground floor the impressive statues were given a cursory glance and the Rosetta stone was declared as “interesting but I can’t read it”. I pointed out the fact on the left heel of the statue of King Amenophis III you can see the carved name of the Italian explore G.B.Belzoni, a bit of 19th Century graffiti, which fascinates me but was given the silent treatment by her. However the beautiful Gayer Anderson cat, representing the goddess Bastet with its gold earrings, nose ring and silver neck amulet was found to be very interesting. As of course was the shop were we looked at everything with great interest! We bought a canopic jar with an Anubis head to show at school plus it was a vital “must have” item for the next part of the school project. We left for home after a very happy 3 hours and it is shared with you to say it really is a great place to visit. Plus it is free entry!! All pictures are curtsey of the British Museum.